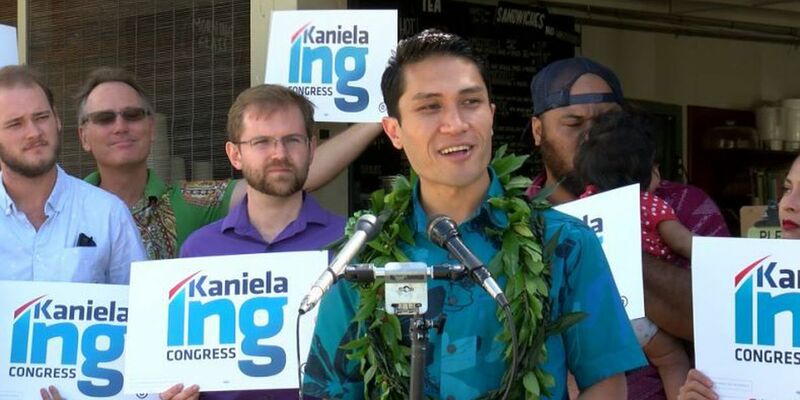 MANOA, OAHU (HawaiiNewsNow) - State Representative Kaniela Ing is the first candidate to officially announce his campaign for Congress. Ing made the announcement fronting Morning Glass Coffee + Cafe in Manoa Monday with a small group of supporters behind him. "I am running for congress because Hawaii's working families are being left behind and needs a representative who knows the struggle of paying for college, buying a home, and raising a family today," Ing said. The 28-year old Maui lawmaker is vying for the congressional seat being vacated by Colleen Hanabusa who is pursuing a run to become Hawaii's next governor. Over his six-years in the State House, Ing has been vocal on issues surrounding the Native Hawaiian community, LGBT and women's rights and criminal justice reform. More recently, the young democrat has also voiced strong opposition to President Donald Trump. "Standing up to Donald Trump and the GOP is important, but it's not enough. Our leaders must be willing to stand up to big-money special interests, and offer a positive vision of progress beyond resistance," Ing said. Ing said he's ready to fight for the people of Hawaii while on Captiol Hill. "My decision to run for Congress was based on how I can best serve and push our values as far as possible," Ing added. He says he and his family plan to move to the First Congressional district which includes Urban Honolulu, Aiea, Mililani, Pearl City and Waipahu.